My apartment is no longer mine, my cat has found a new home, and my bike is packed with 27kg of gear and clothes (36kg counting food for a week and five liters of water). I have everything needed to camp (tent, sleeping pad, water filter, stove), to survive the Himalayas in the winter (warm sleeping bag, long underwear, down jacket, hiking boots), and to repair my bike (extra chain, cables, brake pads, and tools). I even have a dress, skirt, and earrings, so I can feel like a normal gal every once in a while, as well as running shoes (barefoot toe shoes, very light), a book to read, and some pj’s to change into at night. More importantly I have an iPod with two thousand podcasts to listen to as I ride, and two cameras to capture a small portion of the life I am about to begin. Here is all my gear laid out, and then packed on my bike. From working 30+ hours a week, going to school full time, cleaning and packing my apartment, dealing with visas, passports, and buying gear, taking my nursing entrance exam… and overall living a very busy life, I will transform overnight into a girl who eats, sleeps, and bikes. No deadlines, no appointments, no commitments, and absolutely no stress. There will be no bills in my mailbox demanding to be paid, no cell phone to enslave me, and no alarm clock to rudely wake me up every morning. Instead I will get up and go to bed with the sun, and plan my life day by day, not even knowing when I wake up where I will be by nightfall. I will be truly free, the kind of free very few people get to experience. 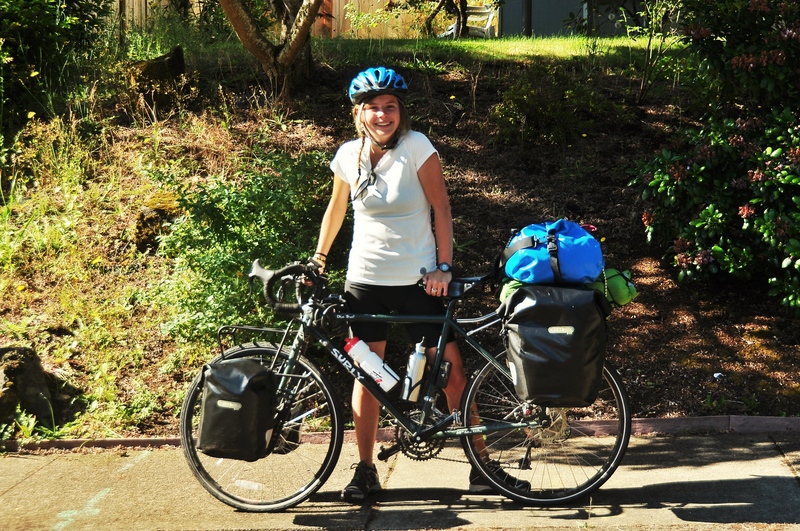 This first stage of my journey, the West Coast of the USA, is one of the highest rated bike-touring routes in the world. Most people follow highway 101 until California where it meets up with the winding and hilly highway 01, a road notorious for being one of the most beautiful drives in North America. There are lots of bike tourers (mostly Europeans) who do this route which makes it logistically easy. In most places it is possible to wild camp, and if not, most campsites along this route are set up with “hiker/biker” spots for a dollar or two a night. This way you get a well deserved shower and a chance to meet other bikers like yourself in the evenings. I have just over five weeks to make it the 3,000 km to San Diego in order to catch my flight to India August 11th. This means I hope to be averaging 100 km a day with a rest day about every five days. That being said, there are days I will do more or less, and in no way have I planned out my route day-to-day (in fact I hardly even know where I am starting), so I will just do the amount of kilometers that feels right for that day. Since I have been so busy these last few months, I did my first test run today (a whole ten miles), right before driving up to Washington to start the real deal. I figure that this first leg of my trip is my boot camp, and that five weeks of biking everyday should be more than enough to whip me into shape. Though the first few weeks will be especially hard, I have all day everyday to bike, so I can go as slowly as I need to. I have no idea what is ahead of me or really the kind of life I am embarking on, but I know that I will love whatever it turns out to be. Here is to the beginning of my life on the road! I’m excited to read about your adventure, please keep us updated when you can. I wish i could do something as amazing as that but I don’t have the time unfortunatly. Have fun and do awesome things!! You are so smart to start with a trip down our coast to get things figured out and your routine and body in shape before going overseas. It sounds like you have had to say goodbye to a lot in order to say hello to this grand adventure. We all hope your troubles are small, your joys are huge and the weather to be moderate.